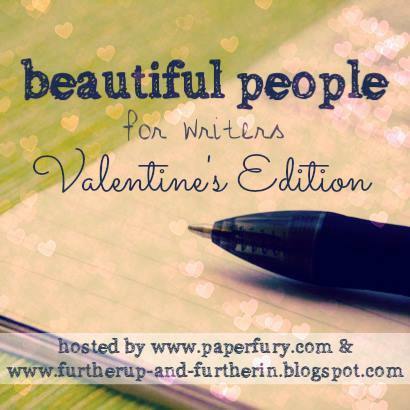 Cait and Sky are hosting another “The Beautiful People” writing prompt where writers make posts about their current Work In Progress Novel idea/creation. I’m still working on Pushing Boundaries, I’m hoping to finish the first draft by the end of March, that way I can write either a second draft of Pushing Boundaries during April’s Camp NaNoWriMo or start a first draft of Wrongful Assumptions. Finishing the first draft of Pushing Boundaries is a lot harder than I thought it would be, turns out I’m missing half my plot and I have realised that my lack of decent conflict outside of petty insecurity between characters is a problem and needs to be fixed, but this prompt is all about Romance, so on with the shipping! How did they first meet? I suppose it depends on your definition of meeting, Olivia and James first come into contact with other through email and social media (the reason for this is because Olivia is involved in a University Student Exchange program and James is a potential host family so to speak). They exchange emails and a Skype call but the first time they met up face to face is at Edinburgh Airport (International terminal), James and his best friend Justine are picking up Olivia from the airport, James has a panic attack, Olivia handles the situation fine but James is super embarrassed about it later. Olivia’s first impression of James online is that he’s difficult and takes things way too seriously (mostly due to the specific lease conditions involved), her first impression in person is mostly the same but she also thinks he’s little over-protective and/or nosy. James’s first impression of Olivia is that because she’s actively involved in her sister’s artistic projects, he wrongfully assumes that Olivia has “an artistic temperament” like her sister (irresponsible, flaky, emotional/sensitive) and to be honest Olivia’s sister Mia is like that a little (okay a lot), but Olivia’s more “the responsible sister” (much in the same way James is the “responsible older brother”). James’s first impression of her in person is that she’s difficult and doesn’t take things seriously enough. How long have they been a couple? Olivia and James aren’t a couple just yet but I’m kind of hoping that they will be a couple (even if t’s just something unofficial or casual) by the end of the novel or at least have told the other how they feel. How committed/loyal are they to each other? Would they break up over a secret or a disagreement? Could stress drive them apart? Would they die for each other? Ah, and now we come to the crux of the problem with Olivia and James’s relationship. There are complications (as all relationships have) and they stem from the fact that Olivia’s only staying in the country six months and James has Autism. It’s not that Olivia see’s him being Autistic as a problem (she’s grown up with someone autistic so it’s not a big deal for her and I know she’ll end up loving him very much) it’s just she doesn’t want to get into a relationship with a person in the UK when she’s just going to leave in six months, also her experiences with people who have autism indicate to her getting into a relationship with James could cause long-term problems (she doesn’t want to hurt him but she thinks a relationship with him is bound to do just that). It doesn’t help that both Olivia and James have problems opening up to people and being emotionally intimate with other people, mostly due to both of them suffering from emotional trauma. 02. Both Olivia and James like tea, with James being a tea-snob (insisting on making the tea himself), but it’s good partnership for them as Olivia makes the scones (with jam and cream) and James makes the tea. I know this will seem cliché, but I’m a big fan of the “Through the stomach” seduction technique. 03. Olivia and her best friend Jack (short for Jacqueline) previously ran a catering business and it’ll be a relevant plot factor thing later on in the book. 04. As James is Autistic, he’s very strict in his food routines (certain foods on certain days) and often finds it difficult to put on weight. 05. The reason Olivia’s very good with cooking and other domestic stuff is because her mother is a mid-wife and her father a police officer, Olivia and Mia were often left alone for long hours at the time and Olivia had to quickly learn how to take care of herself and Mia. Does anyone disapprove of their relationship? Joanna – James’s mother. Joanna had James when she was fifteen and consequently James was more raised by his grandmother Rosemary than by Joanna so she’s always felt insecure in her relationship with James, Joanna also doesn’t understand autism well (she doesn’t have a patience for handling the situation). Olivia, on the other hand, has experience with Autism but also understands autism, Olivia can be more objective. Joanna sees Olivia as muscling in her territory (so to speak) and doesn’t want James getting hurt (especially since James has previously had bad experiences with relationships in the past). What are their personality dynamics? Similar? Contrasting? Do they fight a lot or mesh perfectly? There are more similarities than differences between the two of them, getting them to realise that is the fun part. Their both the “responsible sibling” of the family, their both introverted and they a lot of the same books and movies. James is a big science fiction fan, particularly Hitchhiker’s Guide to the Galaxy, Olivia’s also a big fan of Hitchhiker’s Guide to the Galaxy. However Olivia is a little more playful, she’s more likely to yank James’s chain (but not in a cruel way). One of the big differences between them is affection, James is perhaps a little overly affectionate and Olivia’s more reserved. What have been their best and worst moments together as a couple? There’s a few worst moments (Mwuahahahaha!) I don’t want to spoil too much but one of the major plot points involves taking down James’s arch-enemy whose running a pot-farm on public land (the national parkland near Kirkby Stephen to more precise) and there’s a big conflict scene where the bad guy and his goons show at the farmhouse, Olivia gets injured, James get shot in the arm and they both blame themselves for the other getting injured. Then Joanna lashes out at Olivia for getting her son involved in dangerous activities. Olivia realizes Joanna has a point, moves out and stays with Justine. Olivia doesn’t really explain what’s going on her head the time and James doesn’t know that Joanna essentially blames Olivia for the incident (which isn’t true) and so he has no idea why she’s left and doesn’t know what he did wrong to make her leave. It’s all very dramatic (or at least I’m hoping it will be, I haven’t written that scene yet). Where do they see themselves and their relationship in the next few years? That’s the big conflict (Mwuhahahah), however I think the end goal should be Olivia moving to the UK and becoming a primary school teacher there. However, it might take a while for that to happen. I think it might be more likely that Olivia goes back to Australia, finishes her degree, saves up some money then flies back over again. Also, I have no idea how visa’s work in the UK so I’ll probably need to look into that. I loved reading this!!! And thanks for joining in the linkup!